You probably tried pulling off the black lipstick thing when you were in middle school. Admit it. We all went through that fishnet fashion faze. But here's the thing, we think you ought to try it again. Now's the time to embrace your love of all things witchy and wonderful. Covens everywhere are loud and proud trading beauty potion secrets and charm ingredients without worrying about the fiery consequences of the past. This matte liquid lipstick is far from the shiny gloss you used in middle school. You'll love the classy matte look that matches the black nail polish. 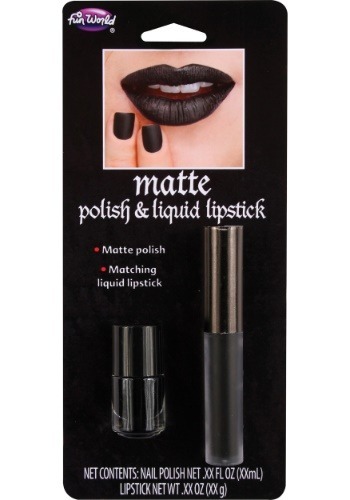 It's easy to look chic and mysterious when you've got makeup that amps up your witchy look. If you're ready to test out your black makeup look, you're not limited to witch costumes. Try out classy zombie costumes, Day of the Dead looks, and even a scary ragdoll ensemble. After all, any costume could use more midnight sassy twist. And hey, we don't blame you if you slide back into your fishnet, smoky-eyed look of days gone by. In fact, we're all for it. Just be sure to wear it with the air of the proud witchy adult you are these days. No need to slide back into teenage angst!